This is a joyous walk along the Cumbria Way. There is a deep rift running through Lakeland from the Skiddaw House area south via St. John's in the Vale, Dunmail Raise to Windermere. The Glenderaterra Beck finds its way through the rift between Blease Fell (Blencathra) on the left and Lonscale Fell on the right. In the middle distance is High Rigg with St. John's in the Vale to its left. High on the left, through the gap, is the Helvellyn ridge and on the right, Steel Fell. 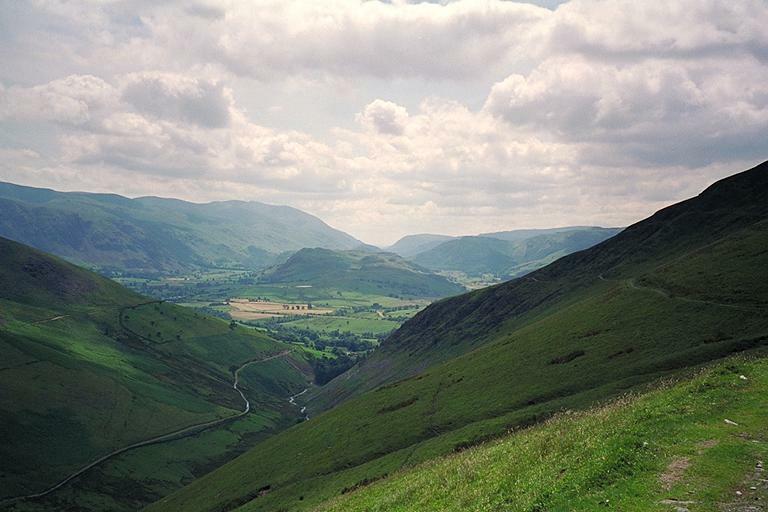 Loughrigg is in the centre, seen through the gap of Dunmail Raise. Smaller version of this picture.